Lush flora… Breathtaking valleys… Soaring peaks… If you want to experience all of these at one place, Panchgani is your destination! Its a pinnacle of greenery; the perfect blend of breathtaking nature with a mix of old-world charm and modernity. This scenic Maharashtra hill station was discovered by the British during the British Raj and was quite popular even among then, as a summer resort. Panchgani is about 19 km from Mahabaleshwar and is closeted from all sides by 5 hills and this is the fact from which it derived its name Panch-gani; ‘Panch’ meaning five and ‘Gani’ meaning hills. This place is also close to the cities, Mumbai and Pune. If you are planning to drive from Pune, you should reach Panchgani within 1 ½ to 2 hours. It is less than 100 KM from Pune. But, looking at the kilometer reading is really not required as you will anyway know you are nearing the place as the aroma of fresh strawberries start mesmerizing your special senses. The fresh strawberries of Panchgani are one of the reasons for the boost Mahabaleshwar tourism has witnessed continuously decades after decades. Panchgani is centered on a sort of a strawberry concept. This place offers you plenty of options for strawberry products – jams, pulps, juices, extracts and concentrates are just few of them. That is why, it is also known as a haven for tourists hungry for strawberry delicacies. 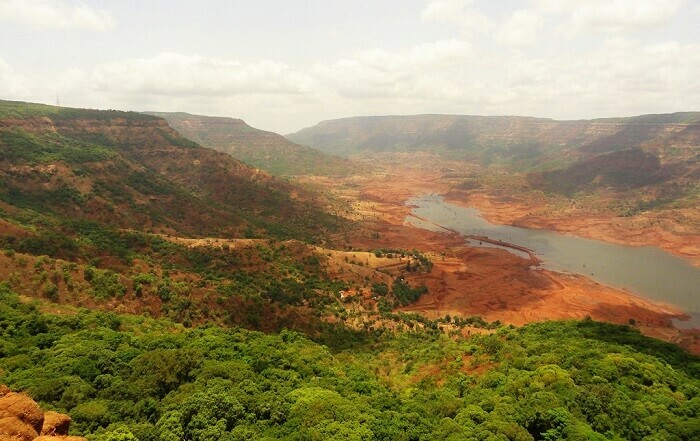 A volcanic plateau, popularly known as the Table Land, tops the five hills that surround Panchgani. This is the second highest plateau in Asia – the Tibetan plateau being the first one – and has been attracting tourists from all over the world. From here, one can have a clear view of some spacious caves including the ‘Devil’s Kitchen’. Sydney Point, another tourist attraction at Panchgani, is situated on a hillock that faces the Krishna Valley. This is the best place to have a dazzling view of the clean glittering waters of the Pāndavgad Dhom Dam and Mandhārdeo. Any description of Panchgani cannot be complete without the mention of the Parsi Point and the Devil’s Kitchen. Parsi Point situated on the way to Mahabaleshwar overlooks the blue shiny waters of the Dhom Dam and the Krishna valley. Devil’s Kitchen holds a lot of importance in Hindu mythology. Situated at the south of the table land, the Devil’s Kitchen is believed to be the place where the Pāndavas of the Mahābhārat epic stayed for a while. Pāndavgad Caves are also believed to be built by them during their stay here. Panchgani is also a hot favorite of those who love to indulge in adventure sports. In fact, Pune, which is very close to Panchgani, has become a renowned name for paragliding training and institutions across the world. This sports activity is open to all throughout the year, except during the monsoon. It offers joyous paragliding experience with all facilities for enthusiastic travelers. For trained individuals, Panchgani offers several paragliding sites with perfect lift and landing sites, thanks to the Western Ghats. That is why Panchgani is considered an unofficial headquarters of paragliding in Pune and Maharashtra. While in Panchgani, one cannot miss the exclusive strawberry therapy at the Ravine hotel. Nothing can be more relaxing than spa treatments at this 3-star hotel. You will come out looking better, feeling more relaxed and energetic like never before with its special rich cream body scrub and facial massage that has all the goodness of fresh strawberries. Now, all this is too tempting to give a miss. So, get ready to enjoy the cool, crisp breeze of mountain air at Panchgani. Amidst the calm and serene topography of this hill station, you will forget all your stresses and tensions and get the real unwinding experience. No wonder, this place is called the Switzerland of Maharashtra.